The back section looks really pretty. It took one and a half balls of yarn to complete the back section of the dress, with the second ball joining on approximately two thirds of the way up. 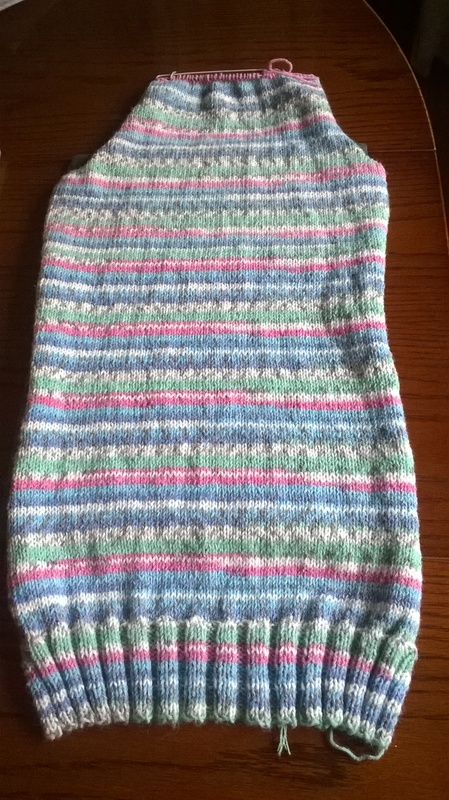 I am knitting this pattern in the fourth size which is 8 to 9 years but it does go up to 12 to 13 years, the larger sizes obviously requiring more yarn, although not that much more (6 x 50 g balls for 12/13 years). I was pleasantly surprised with the effect on the stripes when the second ball was joined (highlighted with yellow rectangle in one of the photographs below), as it has almost given the appearance of a high waistband, with pink edging at the upper and lower edge of the ‘waistband’. The trick will be to replicate this on the front section. 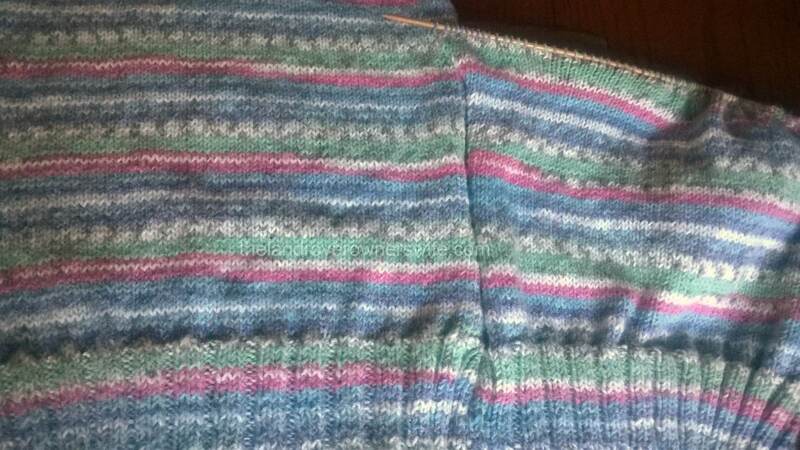 The yellow rectangle marks the join and change of stripe pattern. Oddly, in my experience anyway, the shaping for the armholes didn’t begin with the usual cast off of several stitches at the start of the first two rows of armhole shaping. I think I can safely say that where an armhole has had to be created, the patterns I have used have always started with an instruction along the lines of ‘cast off 3 stitches at the start of next two rows’. This is usually followed with ‘cast off 1 stitch at each end of next [specified number for size] rows’ and this creates the shape to which the sleeve is later attached. 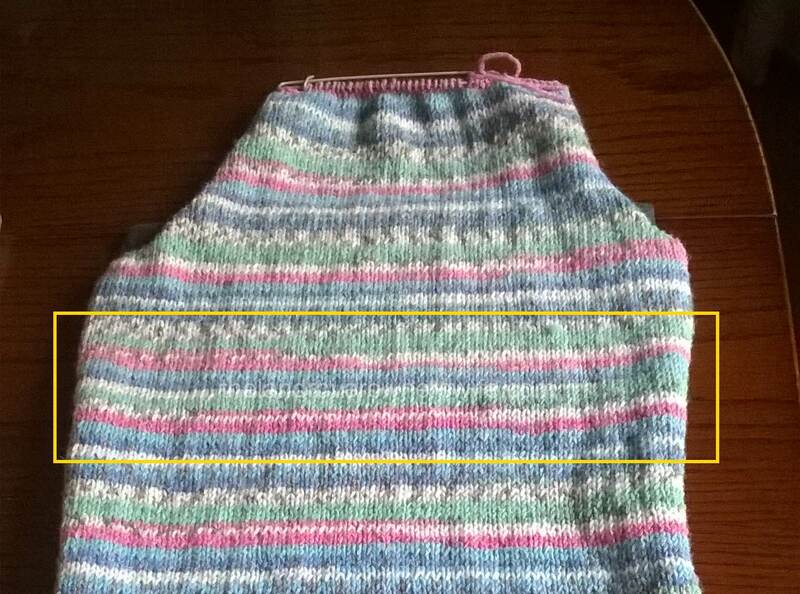 However, this pattern starts with ‘work [specified number for size] rows decreasing 1 stitch at each end of every row’. I was convinced I had missed an instruction somewhere and so went back to check but I haven’t and what’s more the instruction fits in with that given for the shaping the top of the sleeves, so I have managed to learned something new even with what is a straightforward, easy knit pattern. 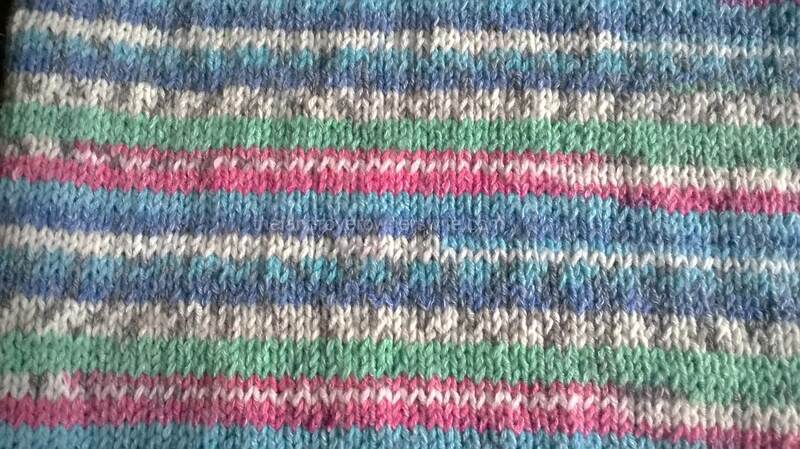 Close up on the pattern made by the yarn …. not quite Fair Isle in my opinion but a nice touch. It didn’t take me long to finish the back section and then I had to cast on the front. 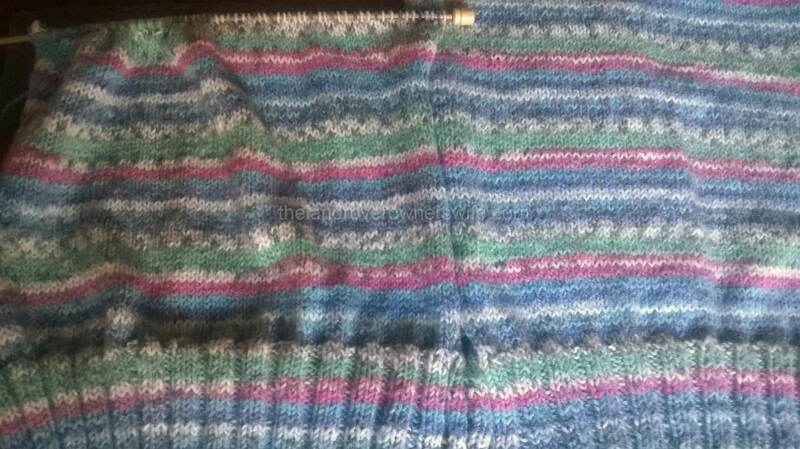 Ordinarily with stripey yarn, I have a ‘see how it goes‘ philosophy when it comes to matching the stripes on front and back sections. After all, half the fun of using a multi-coloured yarn is the not knowing quite how a project is going to look when it is finished and knowing that even if someone else chooses the same pattern and uses the same stripey yarn, your finished garment will still be unique in looks due to the way the yarn has been cut and wound. Stripe matchability: what will be the left side seam ….. This time, however, I decided to see if I could get as close a match in terms of the stripes on the front and back pieces, as possible. …. and the right side seam! Not bad, not bad at all. So when it came to casting on the front stitches, I looked at the three remaining balls of yarn to see if one of them started at approximately the same place in the colour way, as the ball used in the cast on for the back section. Fortunately one of them was very nearly an identical match (six or so inches of light green started the back and this is missing from the front cast on edge) and I am extremely pleased with how the stripes are matching up on both sides of the front to back sections. Soon, however, I will need to try and match the join of the next ball of wool and this may not be so simple, especially if I want to try and replicate the waistband look created on the back section. Only time will tell if I am successful. Categories: .... on knitting, Child knits | Tags: clothes, crafting, fashion, home makes, knitting, Sirdar 2311, Sirdar Crofter DK Alfie, wool, yarn | Permalink. Looking good. Great stripe matching!